"The main goal of SEE 2020 is economic and social growth in the region: employment growth by 12%, increase in mutual trade by 230%, the region's GDP rise from the current 38% to 46% of the EU average", said Goran Svilanovic, RCC Secretary General. "We also want to see an increase in the total inflow of direct foreign investments in the region by 120%, and in the number of people with university education on the labour market by 300,000. In order to make this happen, production, trade, investments and education must be improved, and our national governments must be far more efficient than they are nowadays." The document brings back in the region's focus competitiveness and development, with the EU accession as another important goal, as it leans onto the EU strategy Europe 2020. 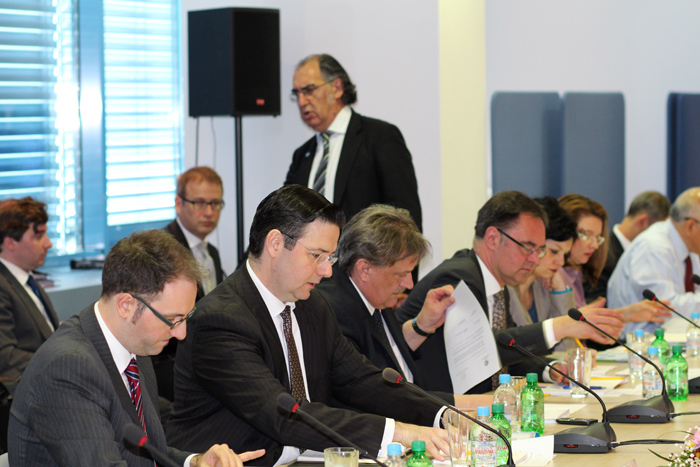 Ministers of economy from the region are expected to adopt the strategy in November this year. The RCC Board also adopted the new statute of the organization, accepted the Annual Report of the Secretary General on regional cooperation in South East Europe for 2012-2013, and heard his report on activities of the organization’s Secretariat in the period February-April 2013. The new RCC statute will be available at the RCC website during the next week. The RCC Strategy and Work Programme 2014-2016 and the Annual Report of the Secretary General on regional cooperation in South East Europe for 2012-2013, will be publicly available following the endorsement by the RCC Annual Meeting, in Ohrid, on 30 May 2013.